Islamabad used to be a small city comprising a few sectors, and suburban areas which mostly included villages. As the population is increasing and a vast majority has immigrated from other parts of the country, there is need for quality housing projects which can cater to the increasing housing requirement in Islamabad. Therefore, we see a large number of housing projects being announced frequently in various parts of Islamabad and adjoining Rawalpindi areas which offer a low cost housing solution to the potential residents. As you already know that Islamabad is continuously expanding towards east, south and north which include zone 2, zone 4 and zone 5, there are couple of new housing schemes which can be considered for investment or future residence due to reasonable prices and flexible payment plans. Some housing schemes actually fall in Islamabad Capital Territory, while many others lie in the adjoining Rawalpindi District which may also be considered part of Islamabad. We will list down and share brief information about some new and existing housing projects in Islamabad and Rawalpindi which are currently available on installments. We hope you benefit from this endeavor and gain authentic information on various housing projects which are currently being advertised in the market. We will share brief information on each of the above listed housing societies, and share related links for more information on subject schemes. 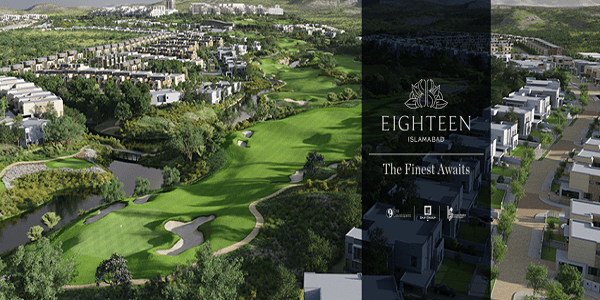 Eighteen Islamabad is an exclusive upscale housing project on main Kashmir Highway by Ora Developers, Saif Group and Kohistan Builders. Part of the project falls under CDA, while major area at the back falls under RDA. The developers have acquired 100% of the project land and all NOCs have been obtained from relevant authorities. Eighteen Islamabad is an expensive project, and it targets the upper class of Islamabad. More than 70% area of the society is kept open for greenery, lakes and amenities. All villas are corner with ample space around each unit. The master plan of the society explains everything, hence you enjoy an elite living experience at the Eighteen Islamabad. It offers different sizes of double storey luxury villas, and different sizes of luxury apartments on 4 years easy installment plan. 10 Marla, 1 Kanal, 2 Kanal, 4 Kanal and 8 Kanal luxury villas, as well as 2 bed, 3 bed and 4 bed luxury apartments are being offered on easy installments. Bookings start from 15% down payment, while remaining amount is payable in quarterly installments. Park View City is a beautiful housing project by Vision Developers in Islamabad Zone 4 near Bahria Enclave. It is one of the most rapidly developing project on the green hills of Islamabad which appeals a lot of genuine home buyers. The developers have a background of development in Lahore by the name of “Park View Villas” which has been a success story. It is important to mention here that Vision Group is owned by Mr. Aleem Khan, who is a senior minister of Punjab Government. 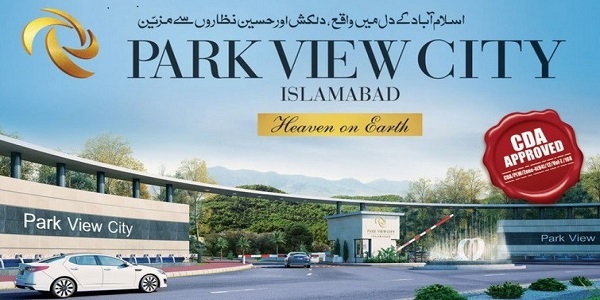 Park View City has an excellent location from the perspective of a potential resident of Islamabad. It lies at about 15 minutes drive from blue area, and you can enjoy the beautiful weather and amazing view of Islamabad from the hills. Development and construction work is going on at full pace, while new bookings are available on first come first served basis. 5 marla, 10 marla, 1 kanal and 2 kanal residential plots, as well as 4 marla and 8 marla commercial plots are available at Park View City on 2 years installment plan. Bookings start from 20% down payment, while remaining amount is payable in 8 equal quarterly installments. 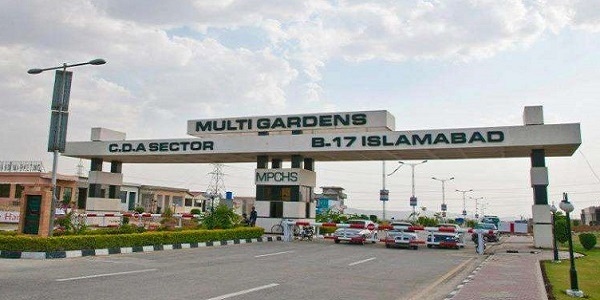 Multi Gardens is a successful housing project of MPCHS Islamabad in Sector B-17. The project comprises various blocks which are developed and ready for possession. Hundreds of houses are built in this society where families are living. Commercial areas have been developed, and all facilities are available to the residents already. G Block is the latest addition to the existing blocks of Multi Gardens. The whole block was sold out within a week or so after the launch, and plots are now selling at good profit in the market. The demand for this project is high, so is the potential for investors or genuine home buyers. B-17 G Block lies along Motorway M-1, and a dedicated interchange has been planned at G Block to provide direct motorway access to Multi Gardens. Development work will take about 2 to 3 years or so, but overall value of this area is going up due to multiple factors including CPEC, New Islamabad Airport and upcoming Margalla Avenue. All sizes of residential plots are available in G block, i.e. 5 marla, 7 marla, 10 marla, 12 marla and 1 kanal. You will need to pay down payment and profit in order to purchase a file in G block. Remaining amount will be payable in 16 equal quarterly installments. Taj Residencia is a developing housing project of Sardar Group of Companies near Sector I-14 Islamabad. The developer is renowned for its mega commercial project “The Centaurus Mall”, hence it enjoys good reputation in the market. The project is already approved by RDA and it has received all NOCs from relevant authorities. Development work has been partially completed, while more blocks have been launched for booking on easy installments. Taj Residencia is planned to be a modern housing project which state-of-the-art facilities for its residents. Development standards are high and pace is commendable. Major attraction of this project is “Centaurus Mall 2” which is planned in the central location of Taj Residencia. The society offers limited 5 marla, 7 marla, 10 marla, 1 kanal and 2 kanal residential plots, and 4 marla commercial plots on 2.5 years installment plan. Bookings start from 20% down payment, while remaining amount is payable in 10 equal quarterly installments. 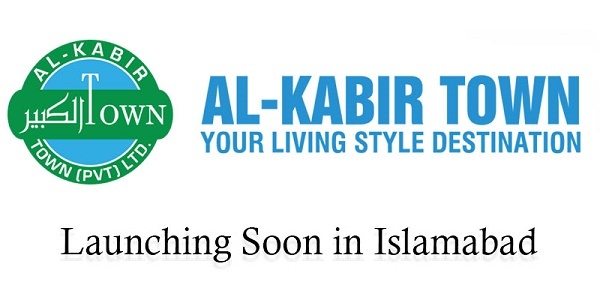 Al-Kabir Town is the latest addition to the new housing projects in Islamabad. The project is currently in pre-launch phase, and bookings of residential and commercial plots are being offered at introductory prices with a flexible payment plan. Al-Kabir Developers have a strong background of housing development in Lahore, and they have successfully delivered their housing projects “Al-Kabir Town Phase 1 and Al-Kabir Town Phase 2” in Lahore. Al-Kabir Town Islamabad is planned near CPEC route on Fateh Jang Road. This location is close to New Islamabad Airport, and the prosperous future of this area is quite evident due to mega developments in the neighborhood. The developers have acquired sufficient land for their housing project, and the project will be officially launched at revised prices after approvals from TMA and relevant authorities. Al-Kabir Town is renowned for rapid and quality development work due to its background of development in Lahore. Hence, we can expect high standards of development in its venture in Islamabad with provision of all modern amenities of life. Al-Kabir Town is currently offering 3 marla, 5 marla, 10 marla and 1 kanal residential plots, as well as 5 marla commercial plots on 5 years installment plan. Bookings start from 25% down payment, while remaining amount is payable in 20 equal quarterly installments. PIA Enclave is a housing project by PIA Employees Welfare Trust on Chakri Road, Rawalpindi. The society lies close to Thalian Interchange, and it is going to get direct access through upcoming Rawalpindi Ring Road. The project is approved by RDA, and initial development work has already started. Since PIAEWT Housing Scheme is mainly meant for the welfare of PIA Employees, it offers discounted prices for PIA employees. Development standards are good, and all basic facilities are planned in this society including schools, hospital, play grounds, parks, commercial areas, underground electricity, wide carpeted roads, street lights, and uninterrupted utilities. 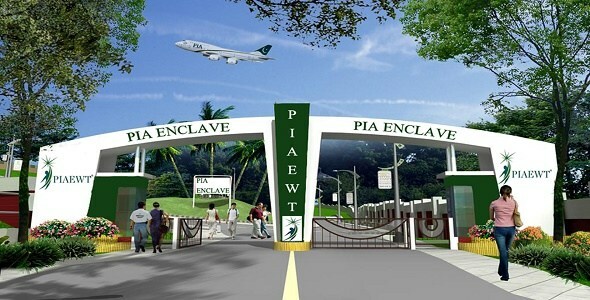 PIA Enclave offers 5 marla, 10 marla and 1 kanal residential plots on 3 years easy installments plan. Bookings start from 10% down payment, while remaining amount is payable over a period of 3 years through monthly and semi-annual installments. Bin Alam City is an upcoming housing venture by Bin Alam Developers near Chakri Interchange on Motorway M-2. The project is currently selling in pre-launch phase at introductory prices, however it will be launched very soon at revised prices. The developers have purchased ample land for the project and also acquired an existing housing society “Media Enclave” which has been renamed as Bin Alam City. 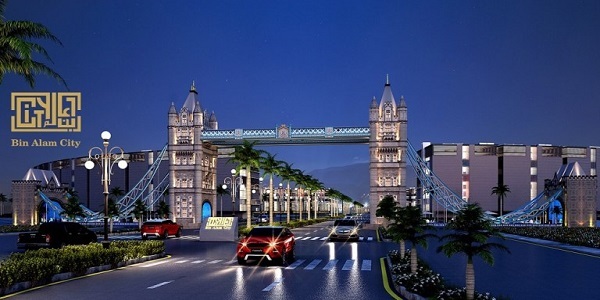 Bin Alam City is a long term, yet attractive investment opportunity. 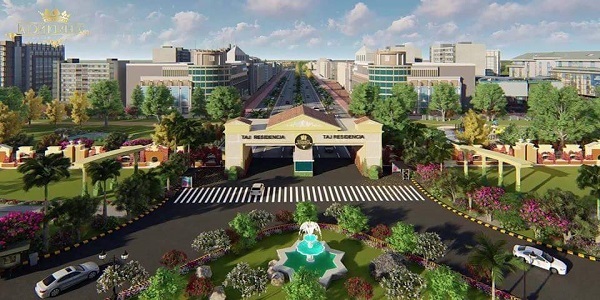 The developers have planned all modern amenities in their housing scheme which includes theme park, golf course, community club, underground electricity, provision of all utilities, dedicated commercial zones and much more. It offers 5 marla, 10 marla and 1 kanal residential plots, as well as 7 marla single storey awami villas at very low prices and very flexible payment plan. Bookings start from 15% down payment, while remaining amount is payable over a period of 5 years. It is also important to mention that Bin Alam City plot prices also include development charges. Capital Smart City is a flagship housing project of HRL on Chakri Road, Rawalpindi. It is one of the biggest housing ventures in Islamabad/Rawalpindi which is planned over 55000 kanals of land along Motorway M-2. The society has received initial approvals from RDA, and development work has also started at the project site. 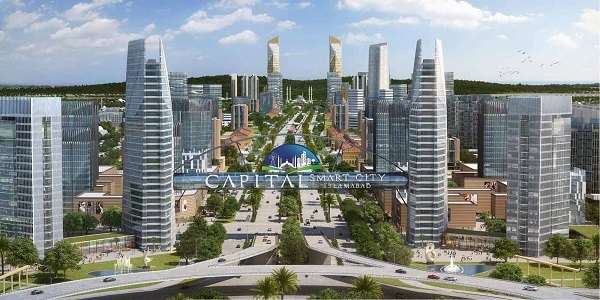 Capital Smart City is the first ever grade 8 eco-friendly housing project in Pakistan. Master plan of the society was prepared by Surbana Jurong, which is a recognized firm from Singapore. Main focus of the developers is on creating a modern self-sustainable city where all public services are automated through implementation of IT infrastructure. Not only does it offer the modern amenities like theme park, golf course, community club etc, but also it focuses on environment friendliness. The project has received very positive response across Pakistan, and people have invested both in residential and commercial plot options. The society offers 5 marla, 7 marla, 10 marla, 12 marla, 1 kanal and 2 kanal residential plots, as well as 4 marla, 6 marla, 8 marla, 10 marla and 1 kanal commercial plots. Bookings start from 10% down payment, while remaining amount is payable over a period of 3 years through easy quarterly installments. 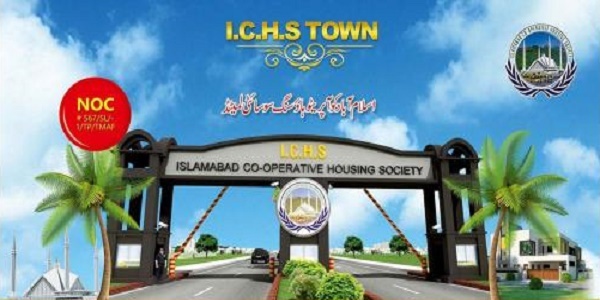 ICHS Town is a cooperative housing society near new Islamabad Airport. It falls under Fateh Jang Tehsil of District Attock, and lies close to CPEC route. It is registered in cooperative societies department of ICT Islamabad, and all NOCs have been obtained from relevant departments. The society comprises 2 phases, i.e. phase 1 and phase 2. The former phase is partially developed, and some construction work has already started in developed parts. The latter one is still non-developed, however you can buy residential plots on easy installments plan in this phase. ICHS Town offers 5 marla, 7 marla, 10 marla and 1 kanal residential plots, as well as 4 marla and 1 kanal commercial plots. Residential plots in phase 2 can be purchased on cost of land, while development charges are payable in 2.5 years through quarterly installments. 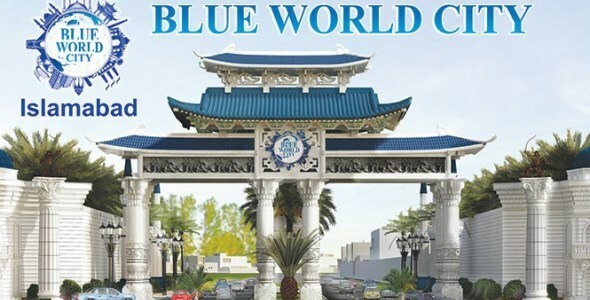 Blue World City is a developing housing project by Blue Group of Companies on Chakri Road, Rawalpindi. The project is said to be a joint venture between a Chinese Company and Blue Group of Pakistan. The developers are currently engaged in pre-launch bookings of residential plots, and acquisition of land, while development work on main gate and initial blocks has also started. NOC of the society is currently under process, however planning permission has been granted already by RDA. Blue World City offers a low cost housing solution, and it offers different sizes of residential plots at affordable prices with a very flexible payment plan. The society is dubbed as Pak China Friendly City due to partnership of Chinese firm. The detailed master plan of the society is yet to be released, however the developers are committed to establishing a well-maintained housing society with state-of-the-art amenities for its residents. We have endeavored to give you all important details on all the above listed projects, so that you can safely invest in any of the given housing schemes as per your choice of location, features or prices. You can go through all the information available on given pages, and contact us via email or given phone numbers for any specific information or booking procedure.